What a fun week for creating! Last Tuesday, way too late to create another card, I received my awesome stamps from Sweet Pea Stamps. In case you haven’t heard about them, here is a little bit of info. The VERY generous Lynette, owner of Sweet Pea stamps has provided the DT with some beautiful stamps to use throughout the month and has a $20 Gift Certificate to give away to ONE LUCKY WINNER this week! Sweet Pea Stamps range anywhere from whimsical to artistic. They are made of high-quality, unmounted red rubber. They have an amazing collection of images from three talented fantasy artists: Ching-Chou Kuik, Elaine Cox, and Lisa Victoria. 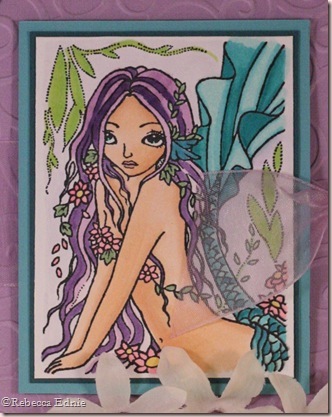 If you would like to see more samples, please check out the Sweet Pea Stamps blog. I loved colouring this stamp. I usually do either soft or vintage colouring so this was quite the fun and colourful departure! 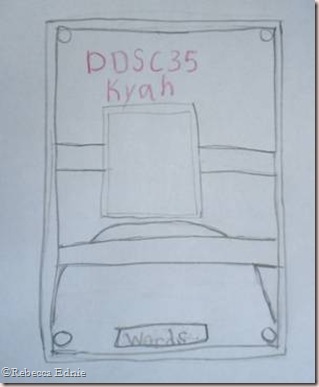 Thanks to young Kyah, daughter of team member and our illustrious team coordinator Jacquie. What a FUN and interesting sketch! This girl ROCKS! I decided to use some awesome but very BRIGHT DoubleMates paper for the card base and the mats. DoubleMates are a series of cardstock papers with TWO colours, one on each side. I wish I had turned the purple paper over to reveal the darker side which could have been sanded to reveal the lighter side. This way, I would have had to sand almost all the way through to get the dark purple to show through. Both layers for the mats are actually from the same piece of two-sided cardstock. Be sure to check out the DIEDRICH DARE Blog for all the details, and a special thanks to Lynette and also our Daredevil Randi, for setting this up! Make sure you play along using DDSC35 if you upload to an online gallery and don’t forget to link your card or project back to Mr Linky on the Whimsical Wednesdays blog. Previous postI have been the WORST blogger! nice layout for the design, and I love the colors! I occasionally scrapbook but my pages are usually pretty simple…always impressed when I see well coordinated and embellished paper designs :). I love what you did with her hair, awesome colours. And you totally rocked the sketch!!! Those flowers are the perfect touch! So pretty! and awesome coloring! oh how i like this bec!love the flowers and how you used them for the circle element – great idea! Really beautiful mermaid Rebecca! Love all the purple! Especially her purple hair! And, the little row of tropical flowers is such a great touch! !